Rock Canyon Kennel is a small, family owned kennel located in eastern Kansas on the edge of the beautiful Flint Hills. 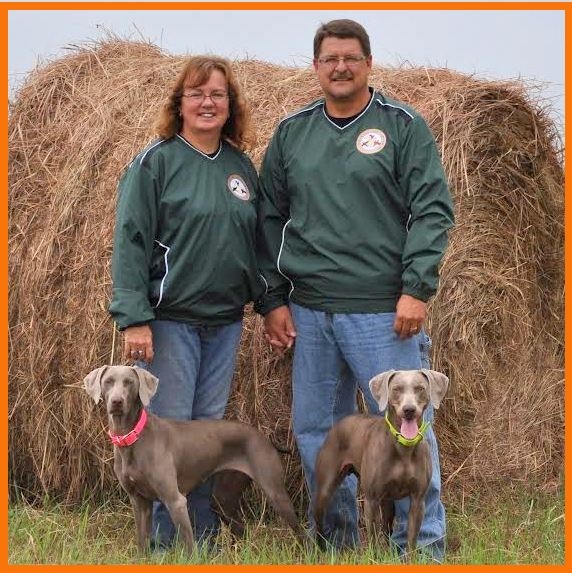 Scott and Shelley Banzhaf are Weimaraner breeders and avid outdoor lovers. They enjoy hunting and camping. They hunt deer and upland game and ducks are in their near future. In the “off-season”, they enjoy training and testing their dogs through the North America Versatile Hunting Dog Association (NAVHDA), and the American Kennel Club (AKC). Silverpoint dogs are a result of many generations of proven hunting lines. Many of the progenitors are titled hunters. Those titles include Versatile Champions and Prize I Utility Dogs, Master Hunters, Amateur Field Champions, and AKC Field Champions. Only dogs who have proven themselves in the field and water will be used in the breeding program. Silverpoint Weimaraners also pay very close attention to temperament and health when planning the next generation. All of the dogs used in the breeding program are health tested for hips, elbows, eyes, and thyroid. Their health records are available on the Orthopedic Foundation for Animals (OFA) website as well as on our website.